When you get a late afternoon hungry tummy rumble, what snack do you reach for to quiet the angry beast? My guess is you walk to the vending machine and buy a bag of potato chips, because salty snacks are a common snack food in the United States. But, I’ve also learned that tiny bag of salty goodness won’t keep my hunger at bay until dinner. I’ve found that fruit will. Why, you ask? Fruit contains carbohydrates that provide energy and slow digesting fiber that quells hunger and keeps blood sugar stable (goodbye 4 PM sugar crash!). Apples are a key player on my healthy and affordable snack roster. 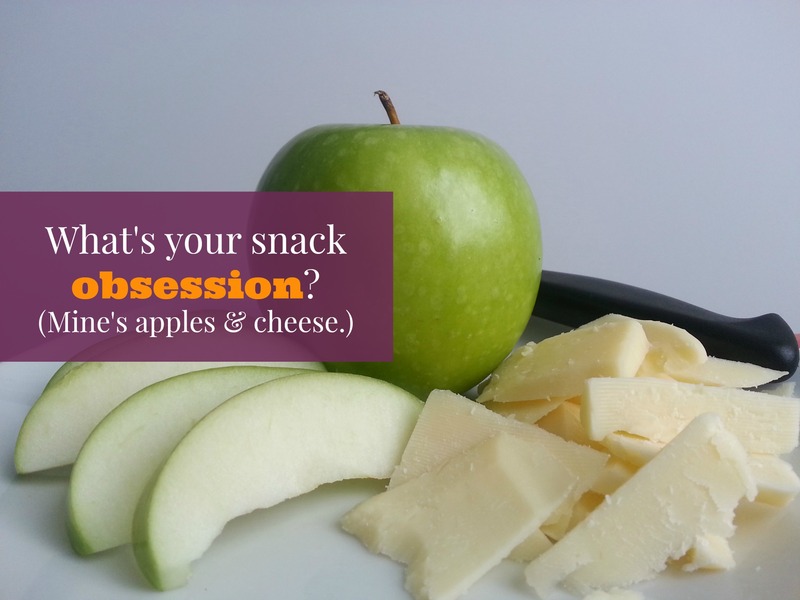 Apples are a healthy snack choice, but obsession worthy? Yes, if you pair your apple with a bit of something special. Not only does adding a bit of cheese to your snack make you feel like you took a mini-vacation, a half-ounce portion of cheese has some healthy snack benefits. You’ll get 10% of the recommended daily allowance of calcium and little bit of fat and protein to help you feel full longer. A medium apple contains about 100 calories, 25 grams of carbohydrates, over four grams of fiber, 14 percent of your recommended daily allowance of vitamin C and is fat-free. A half-ounce portion of cheese contains about 55 calories, zero carbohydrates and three grams of protein. It does contain five grams of fat (three of those are saturated fat), so moderation is the key to making it a part of a healthy diet. What’s your snack obsession? Because mine change over time, I’m always looking for suggestions. Leave them in the comments or take part in the discussion happening on Facebook.